The moth is a small, greyish brown with narrow front wings, conspicuously fringed hind wings, and approximately 8 to 9 mm long with a wing span of 12 to 15 mm. When at rest, the wings come together to form a line of white or pale yellow diamonds down the middle of the back. When the wings are folded while the moth is at rest, these markings come together to form three yellow diamonds, hence the name “diamondback”. The life cycle involves seven developmental stages: egg, four larvae instars, pupa and Adult. Total development time from the egg to pupal stage averages 25 to 30 days, depending on weather. The minute, round eggs are pale yellow or green. 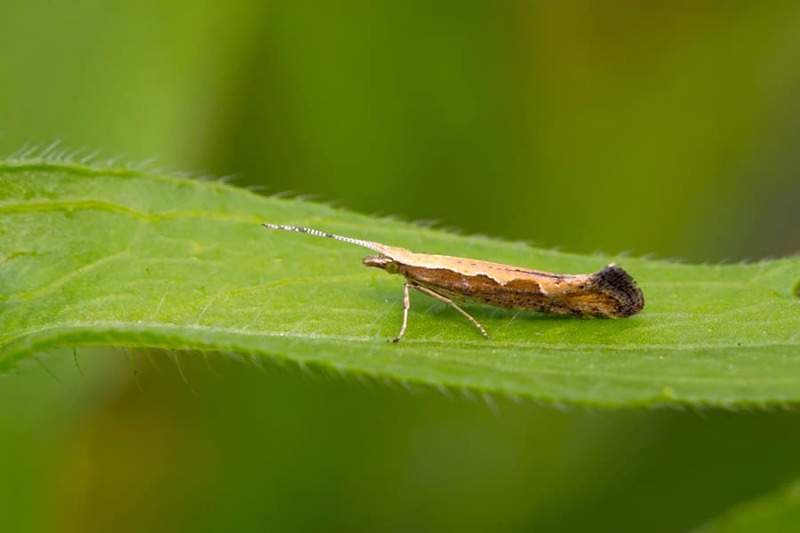 The larvae have four instars, each with an average development time of about four days. The larvae are colorless in the first instar, but thereafter are green. Pupation occurs in a loose silk cocoon, usually formed on the lower or outer leaves. In cauliflower and broccoli, pupation may occur in the florets. The yellowish pupa is 7 to 9 mm in length. The duration of the cocoon averages about 8.5 days. Plant damage is caused by larval feeding. Although the larvae are very small, they can be quite numerous, resulting in complete removal of foliar tissue except for the leaf veins. This "window-pane" damage is very characteristic. This is particularly damaging to seedlings, and may disrupt head formation in cabbage, broccoli, and cauliflower. The presence of larvae in florets can result in complete rejection of produce, even if the level of plant tissue removal is insignificant.